Explore Night Science! encourages 6–9 year olds to safely explore and understand what happens around the world when it is dark outside. Readers are led step by step into integrated, active explorations that uncover the science and technology of the natural and physical world that surrounds them. Kids learn about the rod and cone cells found in their eyes as they test their color vision at night, create a chorus mimicking the sounds of nocturnal animals, and make a personal stardome. Sidebars highlight a real kid who discovered a supernova, how Stonehenge is an ancient almanac, and what elephants and moths have in common. Kids will be amazed at the adaptations used by plants and animals to survive and thrive in the dark of night. 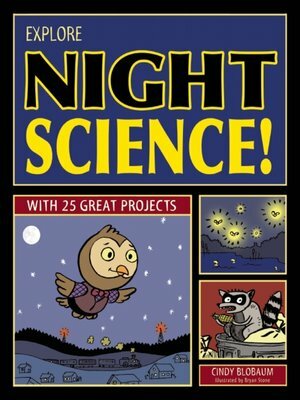 Whether they live in the country or in the city, kids will learn to use all of their senses to investigate the night.